Make Some Memories this Family Day! Family day weekend is here folks. Don’t let it be another loong, boring and lazy weekend! Actually celebrate the day with your Family! 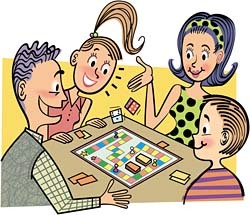 Stay at home this weekend, pull out those board games for something different. Nothing says #Throwback and #Funtimes like good ol’Snakes and Ladders, Game of Life, or Monopoly type of a day. Since your dear plants are missing you, you may want to pamper them. And yes, a fun watch on Netflix will also help cheer everyone up. A marathon run of Friends also sounds great, right? How can we forget about those New Year’s Resolutions you made for 2015 just a few weeks ago? Well, it is time to check to see how on track you are! But wait……what about the grocery shopping? Oh, and the laundry pickup? Relax! Sometimes taking advantage of the weekend does not mean running around to get the groceries or picking up your laundry. Take advantage by skipping the line and the hassle, take advantage of ordering online through us. Your break is yours, but your hassles are on us. This family day, make memories and not to-do lists! < Previous Pick your Super Bowl side and orders today! Next > Mid-week Blues or Reds?